1893 map of Shetland, from Cassell’s Gazetteer of Great Britain and Ireland; Published by Cassell and Company Limited, London. One of the aims of our current project is to establish the cost and workflow requirements for creating a complete virtual collection of the County Surveys. Many of the surveys are already available in various online archives but discovering them is not as easy as it could be and quality and accessibility remain quite variable. In the longer term, we hope to aggregate high quality full-text files that we can use for research-led text mining. In order to establish the projected costs and labour involved in such a project, as part of the pilot we plan to identify one or two rare surveys and digitise them according to current best practices, documenting this process for ourselves and others. Clearly, as funds are limited, it makes sense to focus on volumes that are not already available in digital form and which are rare even in print. The County Surveys project is closely related to EDINA’s Statistical Accounts of Scotland service, for together the surveys and the accounts form the foundations of Sir John Sinclair’s ambitious ‘pyramid of agricultural enquiries’. 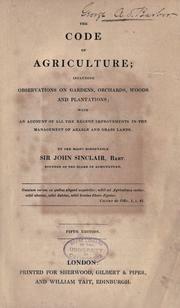 The insights and lessons gleaned from these extensive reports were collected in Sinclair’s 1817 book The Code of Agriculture, the pinnacle of his pyramid, which represented the culmination of decades of work with the aim of ‘rendering, a general knowledge of the principles of husbandry, more easily accessible’. These biases, inventions, and idiosyncrasies are part of what makes the accounts such rich resources for historical research. Aiton’s remarks are illuminating in several respects, highlighting attitudes towards animals, towards the nobility and the poor. They show that the surveyors brought their own opinions and concerns to their reports, creating thick, rich descriptions that offer valuable insights into rural life in the late 18th century. The Statistical Accounts and the County Surveys are ‘sister’ enquiries rather than twins. They complement and enrich one another, enabling researchers to compare different perspectives at different scales, and local concerns and practices at slightly different historical moments. Creating an online collection of the County Surveys, a sustainable service like the Statistical Accounts of Scotland, would be a step towards digitally reconstructing Sir John’s pyramid and would enable researchers to easily read across and between both sets of documents, enabling new insights and readings of both.